Shea is a fourth year graduate student. His research focuses on the organization of optimal microvascular networks. He also studies the electrophoretic flow of particles through gels.. Read more about Shea's work at his personal website. Adam is a fifth year graduate student. His research focuses on asymptotic models for predicting the inertial flows of fluid around posts in microfluidic devices. 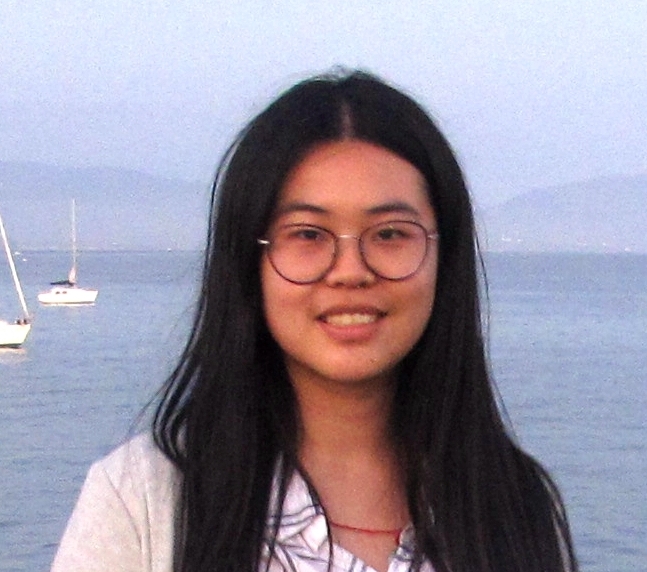 Qiang is a third year applied math major. Her research focuses on how developing image analysis algorithms to measure fungal spore cooperation and the effect of cooperation on the spore fitness. Sierra is a fourth year neuroscience major. In the lab she has worked on mapping the flows of nuclei within growing fungal networks, and self-organization of flows into "nuclear pelotons". Her current research focus is on understanding how fungal spores cooperate by fusion and by communication. Cassidy is a fifth year graduate student . His research focuses on developing efficiently and analyzing efficient methods for optimizing mixing (and other target functions) on biological transport networks. Jesse is studying Engineering at Santa Monica Community College. His research focuses on understanding how wind speed affects the growth of aerial hyphae in Neurospora crassa. Shirlyn is a third year math major. Her research focus is on analyzing data of blood flow through the microvasculature of zebrafish embryos to understand how congestive feedbacks affect the distribution of flows through the finest vessels. Molly has shown no interest in obtaining any kind of degree from UCLA. Her research foci are mushroom hunting, and finding comfortable places to sleep. Kaitlyn's PhD thesis focused on predicting and measuring the movement of particles through inertial microfluidic channels, as well as how interactions between those particles can cause them to crystallize into evenly spaced chains. After leaving the group she went to MIT as a NF postdoctoral fellow. Read more about Kaitlyn's research at her webpage. Linda Ma graduated from UCLA with an undergraduate degree in Biology. Her research in the group focused on understanding how Neurospora crassa chimera manage their internal genetic diversity. After graduating she joined the BMCDB PhD program at UC Davis. Read more about Linda at her webpage. Boya Song graduated from UCLA with an undergraduate degree in Applied Math. Her research focused on understanding how different nuclear populations are distributed in Neurospora crassa chimera using modeling and image analysis to measure the composition of differently labeled nuclei. After graduating she joined the Applied Math PhD program at MIT. Read more about Boya at her webpage. Tushen graduated from UCLA with an undergraduate degree in Applied Math. Her research focused on measuring red blood cells flows in real embryonic zebrafish, to test for the effect of congestive feedbacks. After graduating she joined the Industrial Engineering and Management Sciences PhD program at Northwestern University. Read more about Tushen at her webpage. Teng graduated from UCLA with a PhD in Applied Math. In the lab he worked on modeling population genetics that underlie nuclear distribution within chimeric fungi. After graduating from UCLA Teng joined Armedia as a software engineer. Ruiyi Yang graduated from UCLA with an undergraduate degree in math. His research focused on predicting the flow of viscous fluids through the cellular compartments of fungi. After graduating from UCLA, he joined the applied math PhD program at University of Chicago. Yi graduated from UCLA with an undergraduate degree in Physiological Sciences. In the group she studied the dynamics of nuclear populations in Neurospora crassa mutants that have altered network topologies. After graduating she joined the DDS program at the University of the Pacific. Dae Young Kim graduated from UCLA with an undergraduate degree in math. His research focused on the self-organized dynamics of traffic flowing through compartment models of road networks. After graduating he joined the math PhD program at the Courant Institute, New York University.